Police detained 228 demonstrators protesting against Serzh Sargsyan's appointment as PM, RIA Novosti reports. 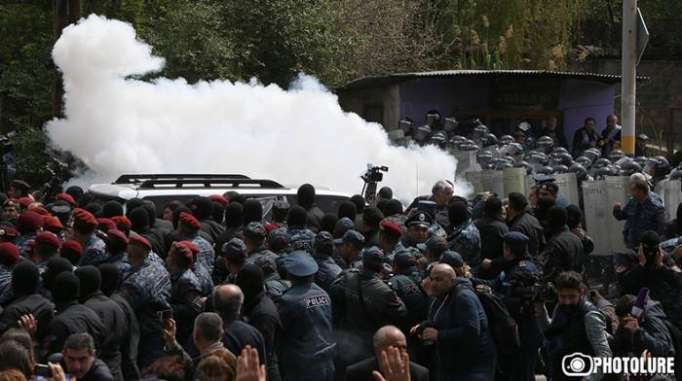 The leader of demonstrators Nikol Pashinyan and two more MPs - Ararat Mirzoyan and Sasun Mikaelyan - were later detained. On April 22, the announced negotiations between Sargsyan and Pashinyan lasted several minutes. The prime minister said that the oppositionist’s actions are blackmail, and advised him to act within the law, threatening that otherwise Pashinyan would bear all the responsibility. Mass rallies broke out in Yerevan and other Armenian cities on April 13 following former Armenian President Serzh Sargsyan’s nomination as prime minister. The opposition accuses him of ineffective governance and worsening of the economic situation. Despite the protests, Armenia’s parliament elected Sargsyan prime minister on April 17. On April 19, opposition members tried to disrupt the new cabinet of ministers’ meeting, blocking entrances to government facilities and marching down Yerevan streets. About 3,000 people took part in a rally in the evening. As many as 123 people were arrested over the day.